Want to score extra points with friends and family on game day? We’re here to help! 7-Layer Bean Dip. Football and bean dip go hand-in-hand, and this easy-to-follow recipe boasts seven layers of fabulous flavor. You can even prepare it ahead of time! Light Queso Dip. Watching the big game and your waistline? 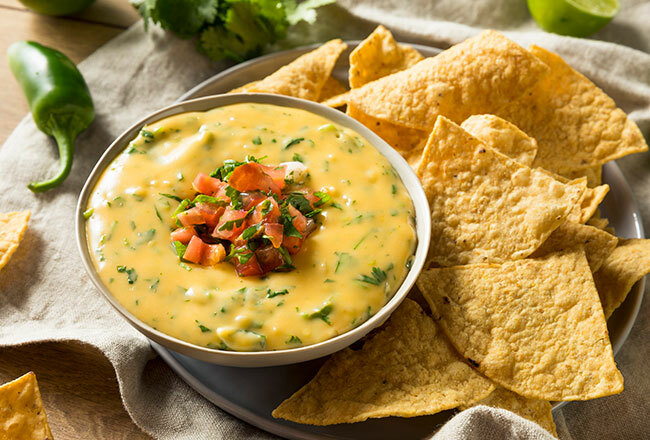 This healthier take on classic beef queso is so tasty, your guests won’t even realize you’ve punted the extra calories! Hot Crab Dip. If crab dip isn’t on your menu, it’s time to adjust your game plan. This mouthwatering recipe includes Parmesan, cheddar and cream cheeses, plus black pepper and hot sauce for a little extra kick. Garlicky Feta Dip. With fresh herbs, tangy tomato and crumbled feta cheese, this creamy dip is perfect for discerning sports fans. Best of all, it only takes five minutes to prepare. Ultra-Creamy Bacon Cheddar Dip. Sour cream and bacon and cheddar, oh my… This five-minute dip will have your guests cheering (even if the opposing team scores a touchdown)! BBQ Chicken Dip. Who isn’t a fan of BBQ chicken dip? And this tangy, cheesy recipe will tackle your taste buds—in the best way possible. Cheesy Meatball Sub Dip. Imagine all the fabulous flavor of a meatball sub in a delectable dip! Warning: It may garner more attention than the star quarterback. Fluffy S’mores Dip. A dessert dip is always a great play at any game day gathering. And this deconstructed s’mores dip is sure to send your party into overtime! For more winning recipes, check out our game day snacks Pinterest board.